For the past few years, the cannabis community has had a growing obsession with dabbing marijuana. This has become an increasingly popular method of weed consumption because it produces a quick, strong, euphoric weed high. However, this method of use has raised serious concerns because of the potential environmental and health risks. If we look at the history of marijuana, dabbing marijuana oils dates back to the 1970s when a small group of cannabis users first developed the technique. With the advent of superior marijuana oil extraction methods in recent years, dabbing has gained popularity among users, especially high school seniors and college students. 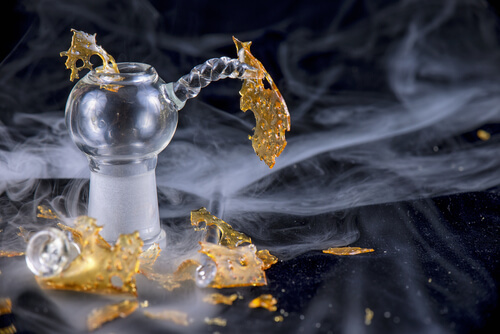 Let’s find out more about what it means to dab marijuana and the dangers of this method of use. How Does a Marijuana Dab Work? What Are the Different Types of Dabs? Why Do Some People Prefer Dabbing? What are the Dangers of Marijuana Wax? How Do Weed Dabs Affect Health? How to Dab Cannabis Safely? 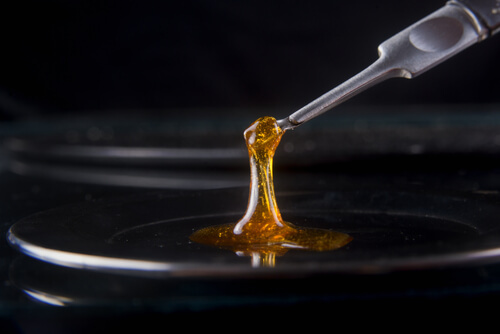 Pot dabs are made by extracting marijuana concentrates with a solvent such as butane. The concentrated butane hash oil (BHO) goes by many names, including honey oil, wax marijuana, and crumble. BHO contains between 50 and 90 percent THC, the main psychoactive component of marijuana (a typical joint contains between 5 and 20 percent). Dabbing refers to the process of vaporizing the marijuana oil by placing it on a hot surface and inhaling the smoke. Marijuana wax pen is a new trend among cannabis users. Dabbing produces a tremendously intense high and is quickly gaining popularity. This method of use produces rapid marijuana effects on brain. However, there is a growing controversy surrounding the phenomenon. With the increasing popularity of special dab vaporizer pens, healthcare professionals have expressed concern about the potential health hazards of smoking wax dabs. Experts have begun to raise awareness about the many dangers of this method. This is a transparent, smooth, light-colored concentrate that resembles a glass sheet and shatters when dropped. 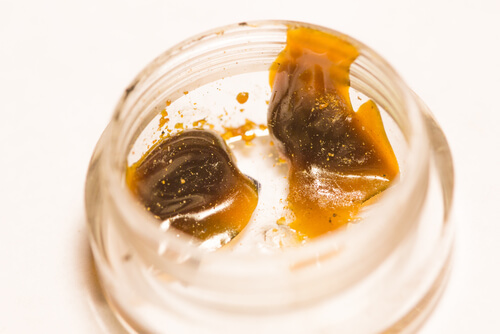 Shatter weed is more potent when smoked and packs up to 80 percent THC. This type of concentrate is collected from the scissors used to cut the leaves and the hands of workers who handle the plants. The sticky extract has a high concentration of cannabinoids. This is a marijuana distillate that is manufactured with a dry ice (carbon dioxide) extraction process. The consistency is grainy and it is easy to melt. It is usually consumed by twaxing (adding cannabis concentrate to a joint). This is one of the purest types of weed concentrates, and therefore, the safest. The cold-water extraction process protects against contamination. The consistency is similar to sand and ice wax cannabis can be consumed by any of the above-listed methods. This looks like marijuana CBD oil but is far more potent and is usually smoked rather than used as an edible. This is a golden, creamy wax which resembles peanut butter in appearance and consistency. It is manufactured with butane extraction and can be used with different smoking methods. This is an easy, safe, and cheap method of making pot dabs. Weed is placed in parchment paper and heated with a flat hair iron. The concentrate is scraped off, collected, and smoked by any method. The extraction process of the BHO concentrate is itself a dangerous endeavor. Many popular online forums provide a marijuana oil recipe and YouTube videos outline a step-by-step guide to the process. Because of this, users who did not previously know how to make marijuana wax now feel confident in trying it at home. However, butane vapors can ignite, causing skin burns, fires, or explosions. BHO preparation is an uncomfortable reminder of the dangers of cooking meth or crack. There have case reports of houses blowing up due to the overconfidence of amateur dabbers. In addition, home-made dabs may contain residual solvents and contaminants. In addition, there are concerns about pollution caused by the butane oil itself which may contain chemical contaminants. The fuel, which is sold for use in lighters, often contains 80 percent butane and additional chemicals such as thiols or sulfur dioxide. Experts warn that these chemicals may be harmful if ingested in the form of marijuana drops. In fact, this kind of butane should never be used for dabbing. Retailers make extensive claims with regards to the refinement and quality of the butane they sell, but these claims are frequently not supported by concrete evidence. Finally, experts also worry about the quality of the recreational and medical marijuana oil itself. Contaminants, such as pesticides and fungi, have been found on tests. The process of evaporating the solvent actually concentrates these harmful ingredients and can potentially cause damage to the immune and nervous systems in the body. With more and more states legalizing pot in the US, medical marijuana oil and other forms of recreational cannabis are becoming easily available. This has brought about a dramatic change in attitude. Many people argue that weed is safer than alcohol and causes nothing more than a buzz. This is despite the fact that marijuana schedule is the same as dangerous illicit substances like heroin and cocaine. Experts warn that long-term heavy use of cannabis can have serious health effects. Most experts agree that cannabis use is not recommended for teens as it can hinder the proper brain development and lower IQ. Dabbing is an extreme form of cannabis consumption. It carries the same risks as smoking, only more pronounced. Paranoia, psychosis, anxiety, and hallucinations are well-known side effects of inhaling weed. What are the additional health risks for someone who dabs marijuana? Addiction: Marijuana dabbing is associated with an additional risk of dependence or addiction. Because of the stronger and quicker “high” it provides, dabbing has an intense effect on the reward triggers in the brain and thus a deeper craving for repeated use. Experts who treat chemical dependence warn that cannabis may serve as a gateway drug that could lead to abuse of stronger, more dangerous substances, especially in individuals who are genetically or emotionally vulnerable. Overdose: Can you overdose on weed? Most users believe that it is practically impossible to overdose on cannabis. What many users do not realize is that due to the high concentration of BHO in dabbing, it may be possible to overdose on cannabis. A survey of about 350 frequent cannabis users revealed that most believe dabbing is more dangerous than smoking pot, but mainly because it causes worse withdrawal symptoms. However, it is a misconception that cannabis cannot be lethal. Bad Highs: BHO or shatter weed contains a very high concentration of THC, the main psychoactive component of the cannabis plant. While information is still limited, critics are alarmed that the concentrated form of weed could lead to very uncomfortable highs, fast heart rate, and blacking out. Accidents, falls, and loss of consciousness may occur after dabbing exposure to a powerful type of cannabis in a single breath. Detox: How long does pot stay in your system? Typically, when smoked, the drug is not detectable after 5-8 days, although some cannabis metabolites may be present in the urine for up to 13 days after use. Given the strong potency of concentrates, detox may take longer, 2-4 weeks, when someone uses a marijuana dab. Accidental Injuries: Compared to smoking, dabbing requires the use of complex equipment such as oil rigs which consist of a glass water pipe and nail. The process also involves an open flame. The use of these devices while cognitively impaired under the influence of cannabis can prove dangerous. Given the current situation in the United States with half the states having legalized marijuana for medical and recreational purposes, here’s an essential guide to safe dabbing. Not all marijuana oil for sale is safe. In fact, more than 80 percent of concentrates are contaminated. Buy concentrates from a licensed distributor to ensure purity. Do not attempt to make concentrates at home as this can result in explosions. Practice safe butane torch use to heat the nail during dabbing. Remove all flammable objects from the area and make sure the nozzle is not leaking. Use the lock on the torch when not in use. Start with a small dosage and slowly increase. A dab is called a dab for a reason. It’s not meant to be used in large quantities. Take low-temperature dabs to enjoy the benefits of smoothness and taste in a safe manner. Keep the dabber clean. Heat it slightly and wipe off between uses. Be careful of injuries from the nail. Use a long dabber to keep the hand away. Be cautious in handling a hot nail. While more research needs to be done, concerns about the potential risks of dabbing marijuana are rising. A 2015 study revealed that more than 80 percent of cannabis extracts are contaminated with pesticides and other solvents introduced during the extraction process. What’s more, the waxes used for dabbing are often made from trimmings instead of the actual cannabis flowers. Some manufacturers are willing to undertake the legal risks associated with dabbing because of the high profits, which leaves potential buyers vulnerable. The market is not yet regulated, making the purchase of concentrates a risky business. Given these concerns, together with the risk of a greater addictive potential and increased health risks, dabbing seems like a hazardous venture that could land a person in drug rehab. If you or someone you love is abusing marijuana concentrates, call our free helpline (888)-459-5511 for more information on drug rehabilitation. Advisors are available to answer your questions, give you more information on shatter weed, and guide you towards a healthier lifestyle. Calls are always confidential, private, and secure.